Although I have never met her, I think that Farley and I would be friends! She is so fun & charismatic, her students are lucky to have her for a teacher! I love the "currently" templates she puts out each month. 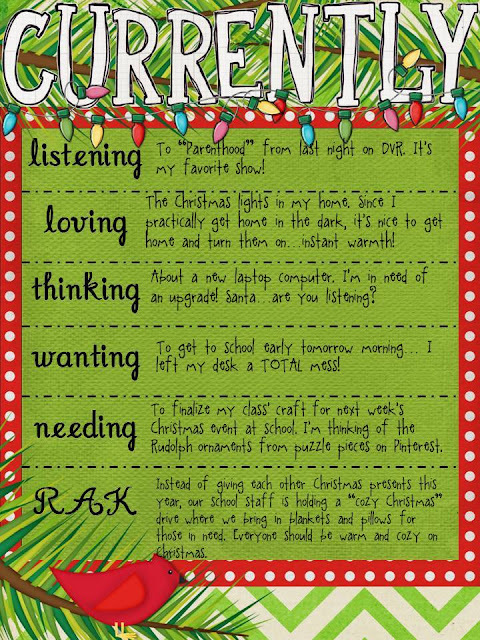 Soooo, here is my December "currently"
The RAK (Random act of kindess) is the perfect feature for this time of year. I am always so inspired when I hear stories of people who truly capture the spirit of giving. I've really been trying to stress to my students that Christmas is more than presents and toys. Speaking of students, are you counting down with your's yet? We have a paper chain of links that represent days of school left until break. We are down to 10 today! Woohoo! It's become a fun part of our morning routine. Christmas break is also significant because it signifies that the school year is HALF over! The end of our 2nd grading period coiincides with this much-needed break. I plan to spend at least a whole day in my room over break getting things organized and ready for the second half of the year. I recently read that this is an exciting time of year becuause you can really see measureable growth in your students. It's so true! Although they're a wild little bunch- they are really becoming little learning machines! I'm seeing big gains in reading, math, and general school habits like staying organized & working independently. Does my heart good! Working on a Freebie Friday for tomorrow! Stop back & check it out! I just found you through the December Currently linky. Love the Cozy Christmas idea :) Very sweet! I also have a Christmas countdown in my classroom... well 2 actually. One where we write the number of days left and that has the shape of a stocking and also I bought them a chocolate calendar :) Every morning one lucky student gets to eat the chocolate of the day. Parenthood is one of my favorite shows too!!!! Although I cry almost every episode! Hi! I just found you through the December Currently. I am your newest follower. I love your idea for a RAK. I admire you and your colleagues generosity. I am new to the blogging world and would love it if you would check out my page http://compassionate-teacher.blogspot.com/ Thanks! What the heck is a Liebster?